There were several interesting developments with relevance to the housing market last week. Rather than let important information fall by the wayside amid the holiday season, this week's newsletter will largely be a reprint of last week's. Interest rate discussion is updated to reflect this week's changes, as is the calendar of economic reports and the list of additional news stories. In order to see the economic calendar or news links in the previous newsletter, you can view it directly. The tax bill that has been at the center of discussion for the Housing Market was officially signed into law last week. 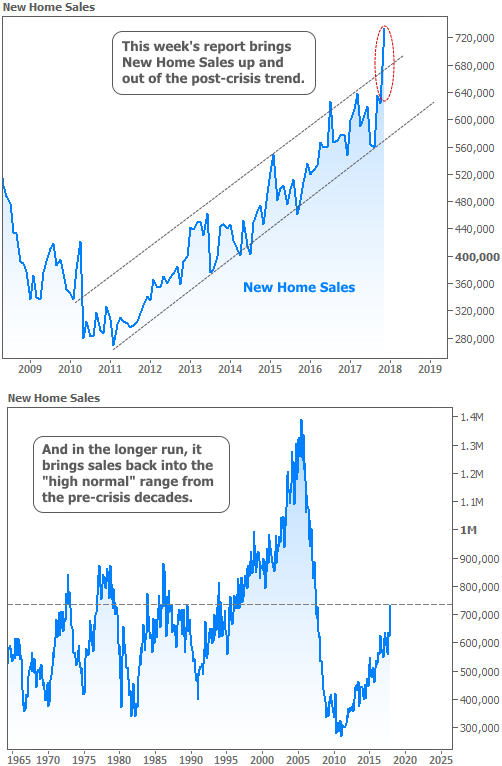 In the days leading up to that, both New and Existing Home Sales surged to post-crisis records. Can the new tax policies coexist with a strong housing market? Capital Gains on Sale of Primary Residence. As long as you've lived in your primary residence for any 2 of the past 5 years, you can still exclude capital gains on the sale of that home, up to $500,000 for joint filers ($250k otherwise). As recently as last week, the bill would have changed that time requirement to 5 of the past 8 years--something that could have greatly inhibited housing turnover. Mortgage Interest Deduction. In the initial draft of the bill, interest would have only been deductible on the first $500k of your loan balance. That number rises to $750k in the final bill (still lower than the 2017 limit of $1m). Any "acquisition indebtedness" (debt that can be traced back to the purchase of the home) that existed or that was under contract to exist as of 12/15/2017 will continue to enjoy the $1m limit. This applies to refinances as well, as long as the new loan is only refinancing acquisition indebtedness. To be clear, that means you cannot write off additional interest that results from a cash-out refinance. Interest on Home Equity Lines of Credit (HELOCs) is no longer deductible, even on existing HELOCs, except those used as purchase money (up to $100k). State and Local Taxes. An initial draft of the bill completely killed state and local tax (SALT) deductions, including those for property taxes. The final bill added $10k back. This might seem like plenty, but in some states, like New Jersey, it's only slightly above average for property taxes alone! In states with a high combination of income and property tax, this $10k limit could have some effect on homebuying decisions, but it would have to be considered against the much larger "standard deduction." Many taxpayers that had been itemizing deductions in these areas are now expected to opt for the standard deduction. All in all, this is a storm that the housing market can weather. It's ability to do so was only reinforced by EXCEPTIONALLY strong sales figures this week. New Home Sales stood out as the biggest winner, rising a whopping 17.5 percent in November. This isn't merely good in the "post-crisis" context. It puts New Home Sales back in a "high average" historical range. Existing Home Sales may not have surged quite as much as New Home Sales, but they too hit post-crisis highs. Moreover, they're in a much stronger spot in the context of the historical trend. The chart below shows plenty of room to weather any effects from new tax policy without exiting a healthy growth trend. 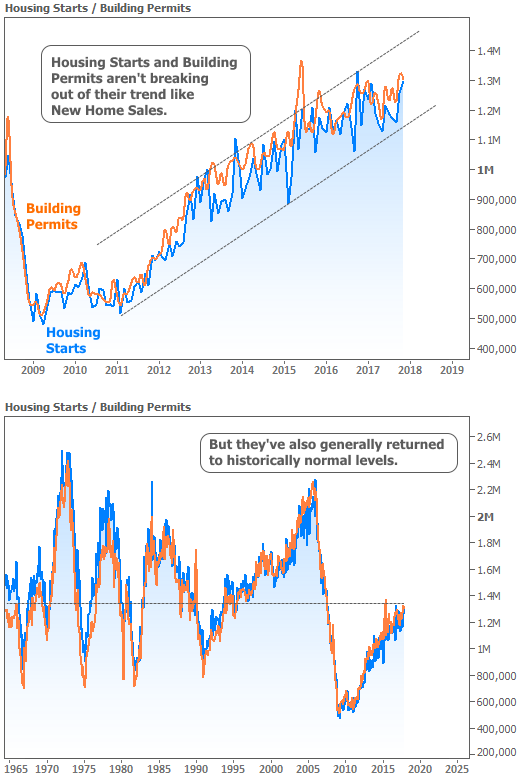 Construction metrics (Housing Starts and Building Permits) weren't quite as balmy as the sales data, but positive trends remained decisively intact. 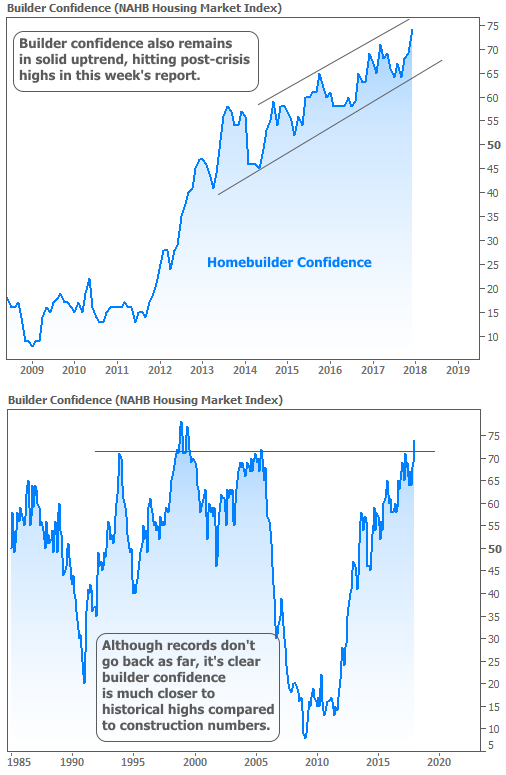 With respectable construction activity and home sales booming, it's no surprise to see builder confidence also exploring a new post-crisis high. In fact, more than any of the week's other housing-related reports, the NAHB Housing Market Index did the most to return near all-time highs. This should be taken with a grain of salt, however, due to the nature of survey data, which tends to oscillate in a steadier range when compared to something like outright sales counts. Other than the uncertainties surrounding the tax bill, the only other cloud on last week's horizon was a fairly abrupt increase in mortgage rates. This resulted from the uncommonly light trading environment that exists at the end of December (and NOT from the tax bill). 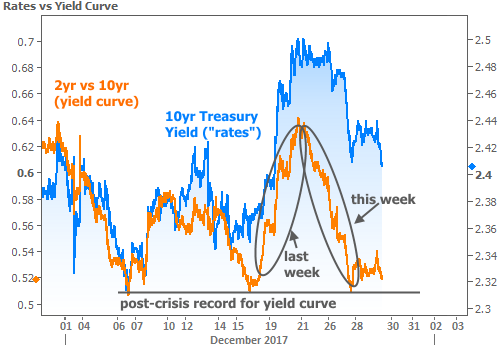 The yield curve (the spread between longer and shorter-term rates, such as 10yr and 2yr Treasury yields) has been a key consideration for traders in 2017. Last week's rate spike was immediately preceded by a bounce at a post-crisis record low for the 2yr vs 10yr yield curve. "Uncommonly light trading environments" work both ways, thankfully, simply because they amplify the effects of imbalances (rates move more than they otherwise would). This week, the imbalance was in our favor. The yield curve returned to those long-term lows and rates followed. As such, we're set to begin January with rates well-within their range from Q3-2017.